The PR ‘toolbox’, that is all the initiatives and activities at your disposal to raise visibility of your business, can really extend as far as your imagination takes it – from media coverage, events and awards to social media and everything in between. One activity of this PR mix that should never be underestimated is networking. The face-to-face connections and relationships that arise from networking can be very powerful in creating goodwill towards you and your organisation. But networking can also become a very expensive, time-consuming and useless exercise if not done effectively. Over the past two years, I have really started discovering the power – and fun – of networking. I am an official member of four groups and I visit many others from time to time. So here are my top nine tips for making your networking efforts successful opportunities for your business. If the idea behind networking is to meet people and create relationships, then dressing in a way that is dull and neutral (and ‘invisible’!) really won’t help you stand out from the crowd. Wear something you are comfortable in, but also something that will give others a reason to look at you and, most importantly, remember you. It could be the colour of your clothing, a piece of jewellery, a tie or your shoes! Know the reasons why you are visiting this particular network. Is it to identify potential clients, learn about a certain topic, recruit new staff, find suppliers or strategic partners, catch up with friends? Prepare some conversation starters – For example, a hot topic in the news, an interesting story you just heard, what their interest is in the event’s speaker, etc. Don’t be shy! Meet and greet as many people as you can. 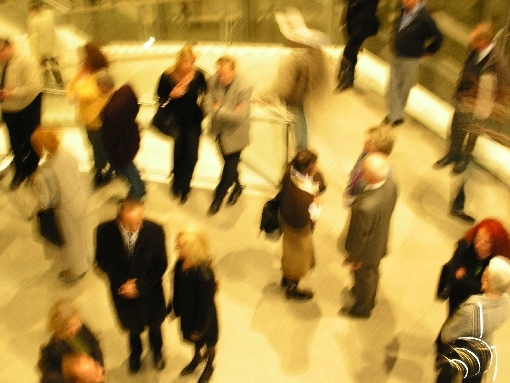 People expect to meet new connections when they go to a networking function so if you introduce yourself to a group of people already talking, it will be welcomed. And if you see someone who’s alone, why not go talk to them? When you introduce yourself, shake hands confidently and call people by their names (as well as being flattering to the person who can see that you paid attention to them, it is a great way to remember their name). Networking is not about selling. Do not expect to go to a networking function and come back with business leads. If you do, it’s a bonus – wonderful but a bonus only. The purpose of networking is to develop connections and relationships, which in the longer term can become great sources of referrals, partners, clients, employees or even just friends! Yes they are business events and therefore it is normal to discuss what your business is about, but the pushy sales statements should stay out of the equation. Focus on building trust first by being genuinely interested in them, being curious and asking them questions (work and non-work related, as you see fit). For contacts made at networking functions to become referrals, partners, clients, employees or friends, they need to be nurtured. Ways to take these connections beyond the event itself include catching up with them face-to-face or connecting with them via LinkedIn. For example, you could have a goal to organise a coffee catch up with at least one person met at each event. To help you remember who you met at the event and add a personal touch next time you liaise with them, you might like to write down – in your database or on the person’s business card – where and when you met the person and one thing they said about themselves or something particular they were wearing that will help trigger your memory. What is your experience of networking? Have you found it a worthwhile PR exercise for yourself and your business? I am curious to read your comments!